Background Guidelines recommend open discussions between patients and healthcare professionals as the end-of-life (EOL) approaches. Much of the knowledge about the EOL is based on the needs of patients with cancer and the applicability of this to other diseases is often queried. A literature review was undertaken concerning EOL care (EOLC) conversations in chronic obstructive pulmonary disease (COPD). Design A systematic literature review and narrative synthesis obtained papers reporting on EOLC conversations between patients with COPD and their healthcare professionals with respect to the prevalence of conversations; each party's preferences for timing and content; and the facilitators and blockers. Inclusion criteria were articles published in peer-reviewed journals, written in English, reporting studies of adult patients with COPD and/or their healthcare professionals concerning discussions of care at the EOL. Results 30 papers were identified. Most patients reported that they have not had EOLC discussions with healthcare professionals. While many patients would like these conversations, a potentially large minority would not; the proportions varied among studies. Healthcare professionals find these discussions difficult and many prefer patients to initiate them. Conclusions Patients' preferences for EOLC conversations vary greatly. Healthcare professionals need to respect the wishes of those not wanting to discuss EOLC and provide multiple opportunities for those who do wish to have these discussions. Recommendations on how to approach the conversation are made. What is the prevalence of conversations about end-of-life care between patients with chronic obstructive pulmonary disease (COPD) and their healthcare professionals? What are each parties' preferences for their timing and content? What are the facilitators and blockers? Although a substantial minority of patients with COPD do not want end-of-life care conversations with their healthcare professionals, most do but are not being given the opportunity to have such a discussion due to a wide range of barriers. COPD is a leading cause of death. This paper discusses the implications of avoidance of conversations and makes recommendations on how they might be approached. The UK NHS EOLC strategy3 calls for open discussions between healthcare professionals (HPs) and patients as the end-of-life (EOL) approaches. This is the first step of the ‘EOLC pathway’,3 to ensure well planned care is delivered. Patient knowledge that death is approaching and of what can be expected is seen as a prerequisite of a ‘good death’.10 Concern has been expressed that EOLC policy and services are based on the needs of patients with cancer, which has a clearer terminal phase: uncertainty over the extent to which a cancer model for EOLC fits with the unpredictable course of COPD has stimulated this review. A 2011 BMJ editorial highlighted the need to establish how patients with COPD will respond to EOLC discussions and their appropriate timing.15 We seek to address these issues in the first systematic literature review of the attitudes of patients with COPD, and those of their HPs. the barriers and facilitators to conversations. The exclusion criteria and process for the literature search, search strategy (box 1 in online supplement), paper selection and the narrative synthesis are described in the online supplement to this paper. The search strategy was complex and generated a large number of titles. After screening and discussion by reviewers (figure 1), 29 papers were found that met the inclusion criteria. One additional paper16 was found when hand-searching Chest, electronically published ahead of print. In total, 30 papers were included (see table 1 in online supplement). Flow diagram. COPD, chronic obstructive pulmonary disease; EOL, end of life. A summary of the findings is presented below. The online supplement presents the results in greater detail. Are these discussions taking place? A wide range of barriers were identified, such as the difficultly in prognostication in COPD which leads to uncertainty over when discussions should begin12 ,26 ,27; and the poor understanding of COPD among the general public.12 ,18 ,26 Additionally, many HPs do not identify EOLC discussions as their responsibility. A good rapport with the patient,12 ,28 experience in dealing with EOLC matters,28 adequate training in breaking bad news12 and specialist knowledge12 ,28 are seen as particularly important. Conversations about EOLC are rare in COPD. Patient preference varies: some want all available information, while others wish to avoid potentially distressing conversations. HPs acknowledge the value of conversations but find them difficult, recognising that not all patients want these conversations. There are numerous barriers and each party prefers that the other initiates the discussion. Patients' preferences are mainly for discussions when disease is advanced; in practice they usually occur late in the disease course (if at all) when there is greater ‘certainty’, though patients are less able to participate. Three previous non-systematic reviews29–31 found a similar prevalence for conversations and planning. Although the search strategy used only the three most pertinent databases, it appears to have been effective. Additional searches identified only one further paper, electronically published ahead of print. Only English language papers were included: most are from the UK or USA, with fewer from Canada, New Zealand or Europe. Additionally, unpublished data and the grey literature were not included. The literature is relatively recent; only three papers were published before 2000. Studies presented a uniform picture with regards to the prevalence of conversations. The data concerning patient preferences were more diverse, partly due to studies investigating a variety of aspects of EOLC conversations, and the diversity of patient samples and disease severity. There are many patients living with the life-limiting illness of COPD who are not being given the opportunity to discuss its progression, their future care and the EOL. A range of barriers inhibit these discussions. Not all patients wish to have such conversations.32 Some may feel they do not have EOLC needs, preferring to focus on management of the disease and its symptoms, having lived with it for years.33 Patients not wishing to discuss EOLC preferences are often those who estimate their prognosis to be excellent, report quality of life to be good and do not desire active involvement in decision making.34 HPs are rarely able to predict individuals' EOLC preferences,30 including preferences for discussions. No single group of HPs felt that their roles, relationships with patients or work settings made them the most appropriate HPs to have EOLC conversations. The NHS EOLC strategy emphasises the importance of multidisciplinary involvement3: while these conversations are a ‘collective responsibility’,28 held on multiple occasions, the danger remains that no HP takes the responsibility. Ensuring that patients who wish to discuss EOLC have the opportunity to do so is challenging. Practitioners and healthcare systems need to address the wide range of barriers that exist, for example, more time is required for consultations or training of healthcare professionals to have these difficult conversations. However, discomfort around the subject of EOL and the uncertainty and difficulties in prognostication are likely to remain. How to do that in practice remains a considerable challenge (box 1). As Sir William Osler wrote, ‘If it were not for the great variability among individuals, medicine might as well be a science and not an art’. Respect autonomy: allow the patient to decide whether to have an end-of-life care conversation, when and with whom. Patient centred: content, timing and pace set by the patient. Multiple opportunities: for the patient to explore issues if they wish. Maintain balance: combine realistic hope with practical planning. Honest information: including acknowledgement of uncertainty. Document discussion: enable other healthcare professionals to be aware of the patient's preferences for care. National Institute for Health and Clinical Excellence. 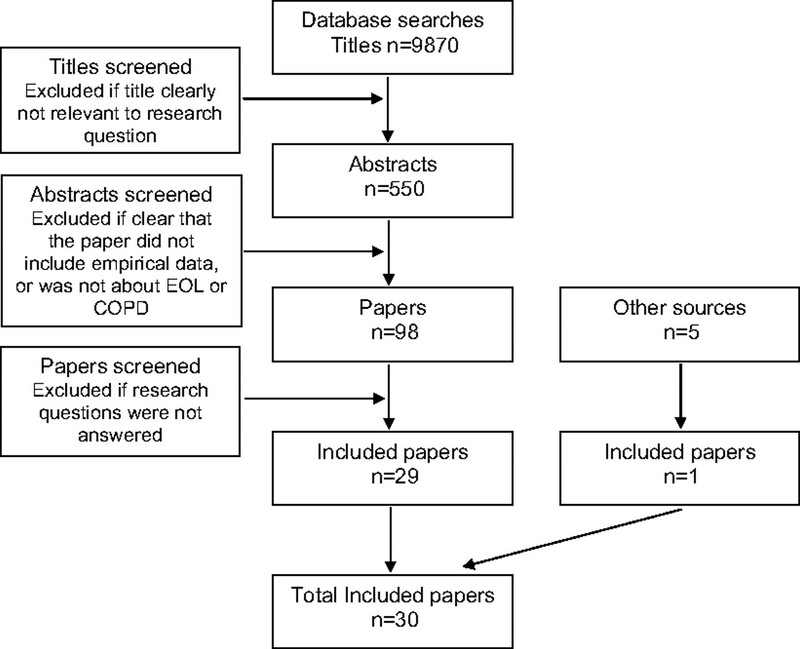 Chronic Obstructive Pulmonary Disease: Management of Chronic Obstructive Pulmonary Disease in Adults in Primary and Secondary Care. London: National Institute for Health and Clinical Excellence, 2010.
. Alternative projections of mortality and disability by cause 1990–2020: Global Burden of Disease Study. Lancet 1997;349:1498–504. Department of Health. End of Life Care Strategy—Promoting High Quality Care for All Adults at the End of Life. London: Department of Health, 2008.
. Palliative care for people with COPD: we need to meet the challenge. Prim Care Respir J 2006;15:362–4.
. Ascertainment of cause-specific mortality in COPD: operations of the TORCH Clinical Endpoint Committee. Thorax 2007;62:411–15.
. The body-mass index, airflow obstruction, dyspnea, and exercise capacity index in chronic obstructive pulmonary disease. N Engl J Med 2004;350:1005–12.
. Palliative care in chronic illness. BMJ 2005;330:611–12.
. An official American Thoracic Society clinical policy statement: palliative care for patients with respiratory diseases and critical illnesses. Am J Respir Crit Care Med 2008;177:912–27. National Institute for Health and Clinical Excellence. Quality Standard for Chronic Obstructive Pulmonary Disease. London: National Institute for Health and Clinical Excellence, 2011.
. A good death. An important aim for health services and for us all. BMJ 2000;320:129–30.
. Living with advanced chronic obstructive pulmonary disease: patients concerns regarding death and dying. Palliat Med 2009;23:691–7.
. Barriers to advance care planning in chronic obstructive pulmonary disease. Palliat Med 2009;23:642–8.
. GPs' views of discussions of prognosis in severe COPD. Fam Pract 2001;18:440–4. The Royal College of Physicians of London, British Thoracic Society and British Lung Foundation. Report 5 of the National Chronic Obstructive Pulmonary Disease Audit 2008: Survey of COPD Care within UK General Practices. London: Royal College of Physicians, 2008.
. Palliative care in people with chronic obstructive pulmonary disease. BMJ 2011;342:d106.
. A randomized trial to improve communication about end-of-life care among patients with COPD. Chest 2012;141:726–35.
. A call for high-quality advance care planning in outpatients with severe COPD or chronic heart failure. Chest 2011;139:1081–8.
. Living with severe hypoxic COPD: the patients' experience. Nurs Times 2005;101:38–42.
. Patients' perspectives on physician skill in end-of-life care: differences between patients with COPD, cancer, and AIDS. Chest 2002;122:356–62.
. How well do we care for patients with end stage chronic obstructive pulmonary disease (COPD)? A comparison of palliative care and quality of life in COPD and lung cancer. Thorax 2000;55:1000–6.
. The needs of patients dying of chronic obstructive pulmonary disease in the community. Fam Pract 2004;21:310–13.
. The experience of breathlessness: the social course of chronic obstructive pulmonary disease. J Pain Symptom Manage 2010;39:555–63.
. Attitudes of 100 patients with chronic obstructive pulmonary disease to artificial ventilation and cardiopulmonary resuscitation. Palliat Med 2004;18:626–9.
. GPs' attitudes to discussing prognosis in severe COPD: an Auckland (NZ) to London (UK) comparison. Fam Pract 2005;22:538–40.
. What do physicians tell patients with end-stage COPD about intubation and mechanical ventilation? Chest 1996;109:258–64.
. Respiratory practitioners' experience of end-of-life discussions in COPD. Br J Nurs 2010;19:1164–9.
. Living and dying with severe chronic obstructive pulmonary disease: multi-perspective longitudinal qualitative study. BMJ 2011;342:d142.
. GP discussion of prognosis with patients with severe chronic obstructive pulmonary disease: a qualitative study. Br J Gen Pract 2004;54:904–8.
. Advance care planning in chronic obstructive pulmonary disease: barriers and opportunities. Curr Opin Pulm Med 2011;17:103–9.
. End-of-life decision-making: special considerations in the COPD patient. MedGenMed 1999;3. http://www.medscape.com/viewarticle/408735. [formerly published in Medscape Pulm Med ejournal 1998;2(5)].
. Palliative and end-of-life care for patients with severe COPD. Eur Respir J 2008;32:796–803.
. Knowing patients' preferences for place of death: how possible or desirable? Br J Gen Pract 2009;59:642–3.
. Palliative care or end-of-life care in advanced chronic obstructive pulmonary disease: a prospective community survey. Br J Gen Pract 2011;61:e362–70.
. Patient preferences for communication with physicians about end-of-life decisions. Ann Intern Med 1997;127:1–12.
. Hope for the best, and prepare for the worst. Ann Intern Med 2003;138:439–43. Funding This study was funded by the NIHR CLAHRC (Collaborations for Leadership in Applied Health Research and Care) for Cambridgeshire and Peterborough and Macmillan Cancer Support: their support is gratefully acknowledged. The opinions expressed are those of the authors not the funders. Data sharing statement We would be prepared to share data extraction sheets.